The unusual aspect covered very effectively by the author is the Pals’ Battalions. Today, expectations and use of qualifications encourages individuals to join a military organization as an officer and to accept whatever postings follow. There are still British regiments where several members of a family might serve together but that is the exception rather than the rule and becomes progressively rarer as the number of regiments reduces and the old practices of drawing recruits from a small geographic area fade away. The author has done a good job in researching and drawing content from letters and diaries, to produce an account that is poignant and uplifting together. He has also shown how those left behind in London took special interest in “their battalion” and how Livery Companies gave money to buy weapons and also instruments for the band. The Lord Mayor was made Honorary Colonel, any family and friends sent parcels of food and gifts. It was a very close family and every loss was deeply felt. DESCRIPTION: The author has covered one aspect of the Great War that may be a particular novelty for the modern reader. The weapons of war are fairly easy to understand because many of them soldiered on through WWII and even into very recent times. As they have started to phase out, their replacements are similar in many respects and large quantities of WWI designed weapons are held in reserve stocks around the world. Uniforms and units are still familiar and soldiers continue to drill in much the same way. This means that many of the books emerging during the next few years will deal with concepts and activities that are not far removed from those of today, and technology has evolved rather that suffered a revolution. The Great War was in several respects son of the past that incorporated some novel technology, rather than being the start of a new military environment. One aspect demonstrating that heritage was the establishment of battalions and regiments that were staffed by people from the same streets or occupations. That in turn made the Great War terrible because whole streets and communities of young men, and not so young, were wiped out in days. Some communities never recovered from the losses. It was in this environment that the Stockbrokers’ Battalion was created. Young men from the middle classes volunteered and found themselves alongside the same people who had sat at desks next to them or crowded onto dealing room floors. They spoke the same language in the same accents and with the same jargon. Many of these young men could have qualified for commissions and been sent to any one of many units where all their new comrades would be strangers when they came together. They were happy to enlist because it meant they reached the action faster and were guaranteed a place with friends and relatives. In 1914 there was also a rush to get into action because everyone expected the war to end by Christmas, then the next Christmas and so to the end in 1918. 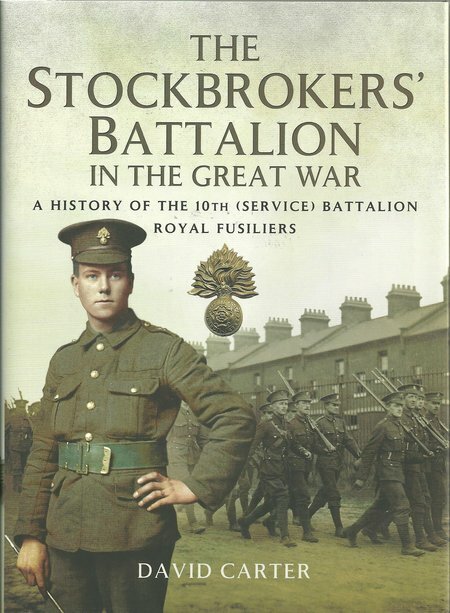 To fully understand the story of the Stockbrokers’ Battalion, it is necessary to understand the social factors of the time, at an age where duty and obligation came before rights and entitlement. The author has provided a readable account that goes a long way to help the reader understand, but the practices of the time were of another country. Any reader born after 1960 may struggle to achieve a full understanding, but this book does much better than many others to help the process.